Hands-on computer exercise utilizing iCAT cone beam CT scans of the cadaver specimen on which you will be performing bone grafts. Each participant will evaluate the CT scan using the EasyGuide™ software. Each participant should be able to evaluate the sinus for: height/width, septa, sinus floor, determine the best place for the sinus window and determine if the osteomeatal complex is patent. In addition, with regard to bone, each participant should be able to address bone height/width, density, and perform virtual implant placement. Tracing of the inferior alveolar canal will also be evaluated. joined the Medical University of South Carolina faculty in 1985. He is a Professor and Char of the Department of Stomatology, Directory of the Division of Periodontology. 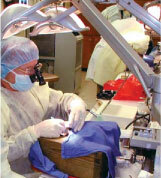 He maintains an active practice limited to Periodontics within the College’s Dental Faculty Practice. Dr. Gellin is also the administrator of the College of Dental Medicine’s clinic management software. 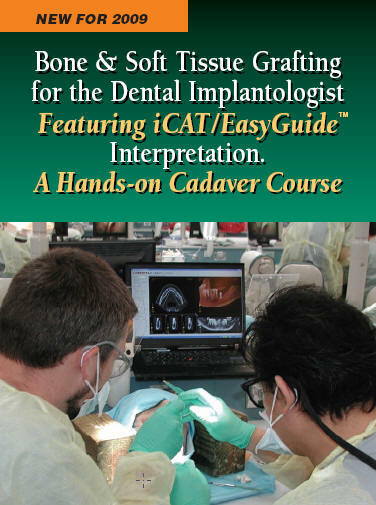 This entry was posted by Dental Continuing Education on December 22, 2008 at 2:48 am under Bone Grafting, Hard Tissue Grafting. You can leave a response, or trackback from your own site. Follow any responses to this entry through the RSS 2.0 feed.